Electrical, plumbing, and mechanicals. The entire house was re-plumbed and re-wired. A new on-demand gas hot water heater was installed in the small mechanical room off the back porch. Here you can see the ductwork for the new kitchen range hood. Multiple insulation strategies. 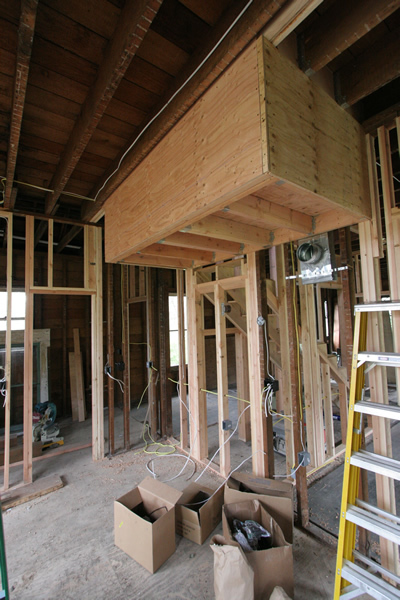 In an old house you often have to work with the wall space you are given to achieve whatever measure of weatherization you can. Already very limited headroom precluded furring out walls and losing even more height. 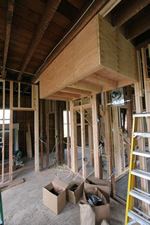 Walls received a blown-in-bat (BIB) system that conforms better to irregular spaces. The ceiling received thick fiberglass bats that could protrude up into the attic space. 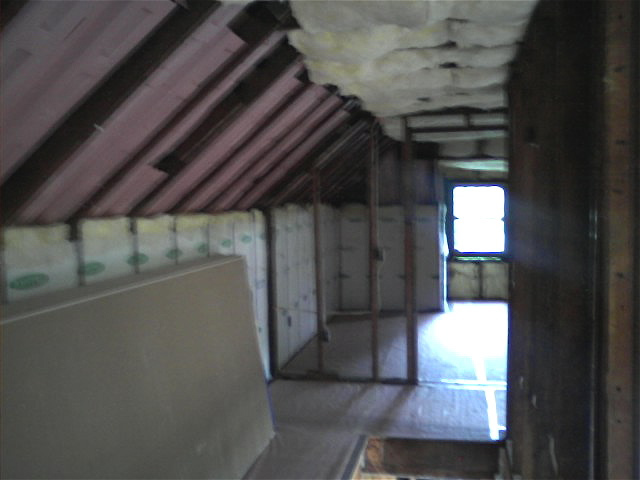 The slopped ceilings here have pink vent baffles installed to maintain air flow through the roof, and will next receive a high r-value spray foam in the few inches of remaining space. Sheetrock has been stocked and is ready to hang. 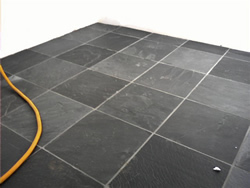 New slate floors. 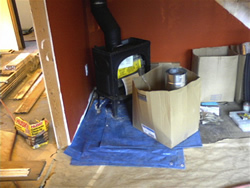 The subcontractor – a relative of the homeowner – did an excellent job in an unheated house. Lesson learned – wait for heat! 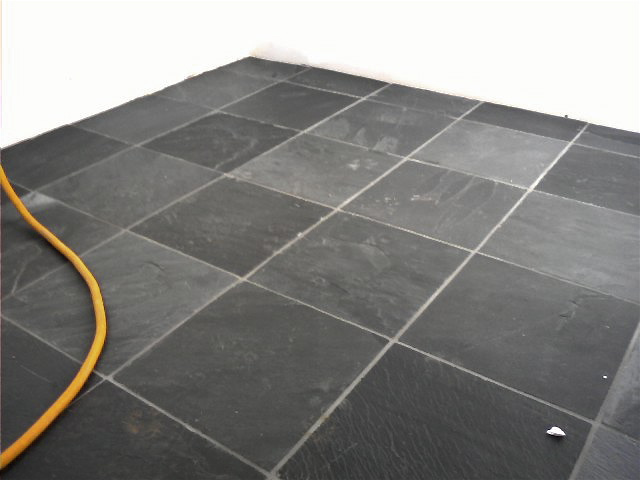 Also, always think twice about slate, which is notoriously uneven and difficult to lay flat. The stone is very porous and each piece had to be pre-coated with sealer and stood to dry before installation so that adhesive would not permanently stick to the upper surface. Then during laying each piece had to be individually “back buttered” and carefully adjusted for height because of the varied thicknesses. End result – a beautiful floor! A new gas heater in the dining room will provide the basic heat for the whole house. Some oil filled baseboard units were also wired into various other rooms for backup. Notice the bundles of trim in the kitchen. All of the original trim from the house had been salvaged by the homeowner during the demo process, de-nailed, and wrapped in bundles for each door and window.